This research was designed to explore the protective effects of sodium selenite on G0/G1 phase arrest induced by AFB1 in thymocytes of broilers. Two hundred eighty-eight Cobb broilers were divided into control group, + Se group (0.4 mg/kg Se), AFB1 group (0.6 mg/kg AFB1), and AFB1 + Se group (0.6 mg/kg AFB1 + 0.4 mg/kg Se). 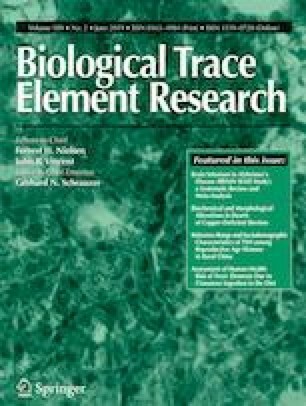 The results revealed that 0.4 mg/kg Se supplement in diets could improve the AFB1-induced histological lesions in the thymus consisting of the more vacuoles and nuclear debris in thymic cortical area. The results of flow cytometric detect showed that 0.4 mg/kg Se relieved the G0/G1 phase arrest caused by AFB1 in thymocytes. The results of transcription levels of ATM, p53, p21, p27, p15, p16, CyclinD1, CyclinE, Cdk6, Cdk2, and PCNA genes by qRT-PC, and protein expression level of PCNA by immunohistochemistry demonstrated that 0.4 mg/kg Se could reduce the adverse effects of AFB1 on these parameters. In conclusion, Se could relieve AFB1-induced G0/G1 phase arrest by p15 (or p16)-CyclinD1/Cdk6, ATM-p53-p21-CyclinE/Cdk2, p27-CyclinE/Cdk2 pathways. Ke Guan, Hang Li, Zhicai Zuo, Fengyuan Wang and Ping Hu contributed equally to this work. This work was supported by the program for Changjiang Scholars and University Innovative Research Team (PCSIRT) (No. 0848) and the Education Department of Sichuan Province (2012FZ0066) and (2013FZ0072). The use of broilers and all experimental procedures involving animals were approved by the Animal Health and Care Committee of Sichuan Agricultural University (approval No. SYXK2014-187).